Well Shiver me whiskers, sound the Octo-alert, its Captain Barnacles the polar bear from the TV show Octonauts, I know there are many people out there who will be pleased to see this, I seem to remember Arty liking the Octonauts, I hope you all like him. 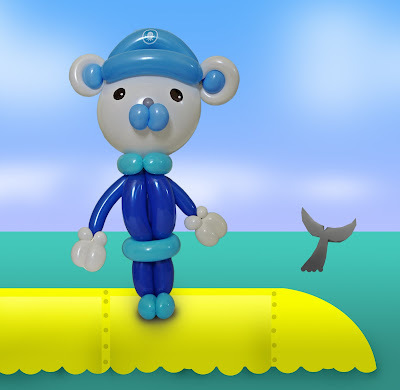 Captain Barnacles is made from 9 balloon, the head is a round 11" balloon with the body from 260s and then various other bits from other 260s and 160s. I used 3 raisin twists in the white round balloon, 1 for each ear and 1 for his nose.